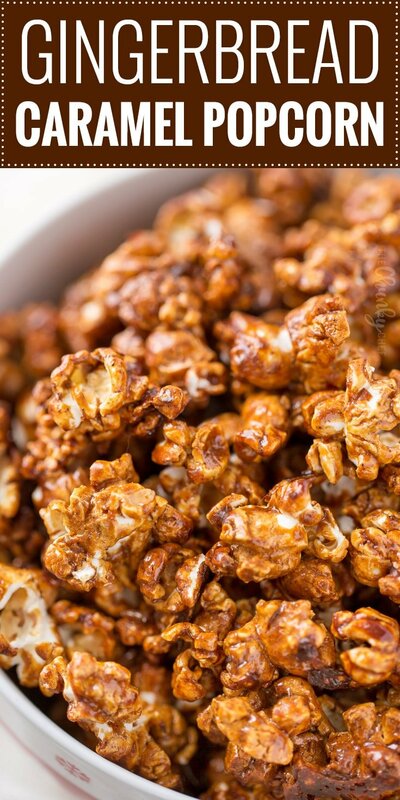 Easy homemade caramel popcorn, with great gingerbread spices. You won’t believe how easy it is to make this classic sweet snack! 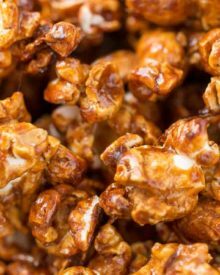 Caramel popcorn is such an easy sweet treat to make, and this version has sweet gingerbread spices mixed in with the buttery caramel. 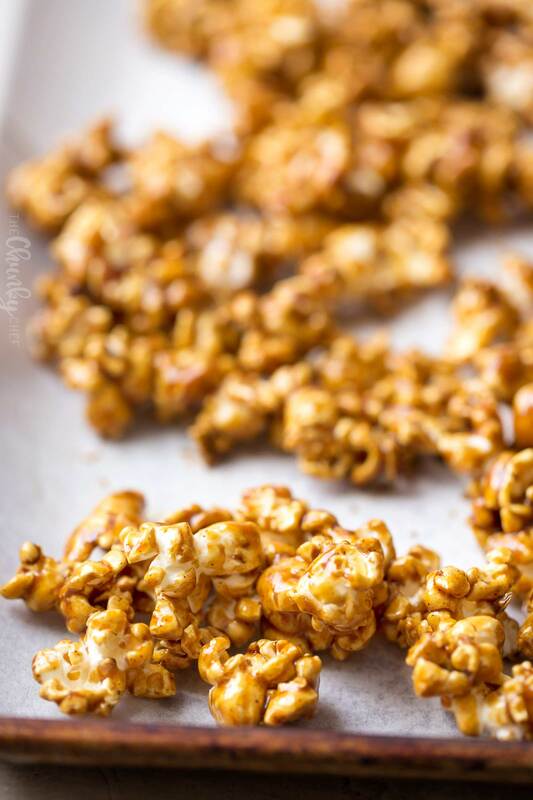 You’ll never want store-bought caramel corn again! Can you believe Christmas is a week away?! I’m amazed at how quickly December (well, this whole year really), has flown by. I don’t know about you, but I still have SO much to do! I don’t even have all my gifts yet (but they’re coming at least), and I haven’t wrapped a thing… eeeeek!!! With so much to do this time of year, the last thing you need is a complicated holiday dessert/snack right? 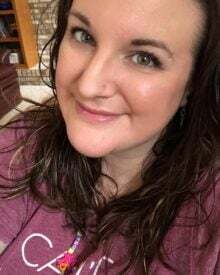 That’s why even though the year is winding down (I only have one more post to share with you in 2017! ), I knew I had to sneak this one in. It’s so simple to make, and has only about 15 minutes (if that) of hands-on time! This time of year those big tins of multi-flavored popcorn with the winter scenes painted on the side are in about every store. My Grandma used to love those, so we’d always pick up a couple. My absolute favorite part has always been the caramel popcorn! I think it’s because it reminds me of my all-time favorite snack… Cracker Jack! On to THIS caramel popcorn. 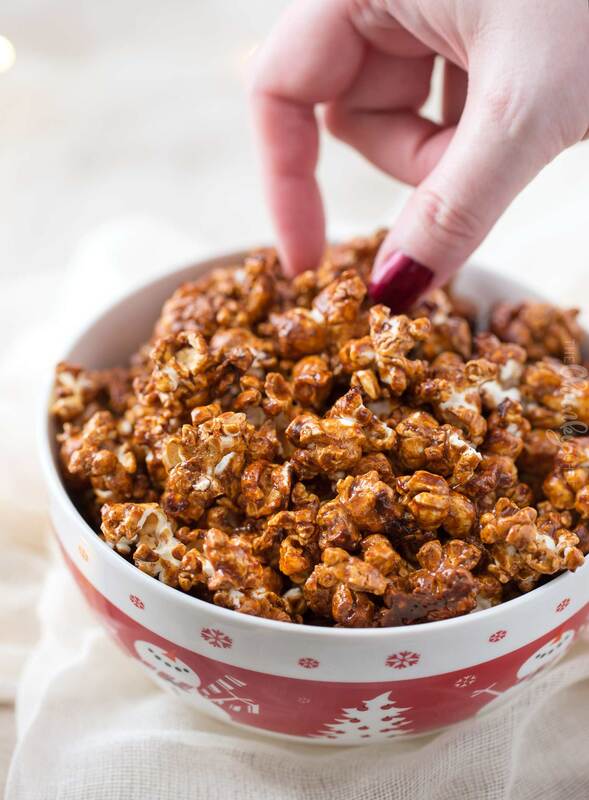 Oh man, the gingerbread spices give this caramel corn a great subtle flavor twist that will have you coming back for handful after handful! 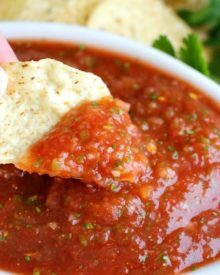 To measure sticky ingredients like the molasses and corn syrup, lightly spray the inside of a measuring cup with non-stick cooking spray. It really helps! A rubber spatula works like a charm too. Make sure you line your baking sheet with parchment paper that’s been sprayed with non-stick cooking spray. Baked-on caramel is definitely not fun to clean up! I usually use a bag of pre-popped popcorn, microwave bags, or use popcorn kernels in a glass bowl… check out the tutorial for that here. 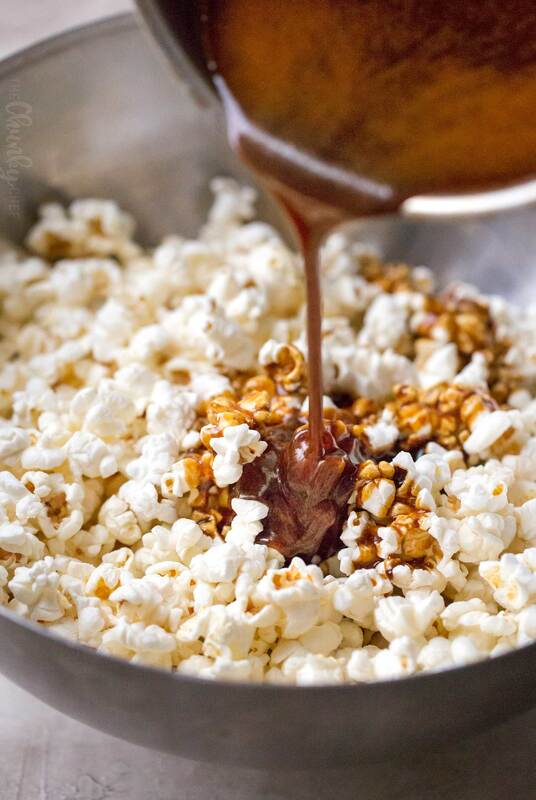 After you’ve finished making the caramel sauce, as you’re pouring it over the popcorn, don’t just glob it on… drizzle it around and stir it quickly. It will start to harden pretty fast. On that note, don’t worry if all the popcorn is coated. As it bakes, the caramel sauce will loosen up some, and when you stir it, it should cover most of the popcorn. Heavy bottomed saucepan – I have several high-end brand pans, and this one outperforms them all! 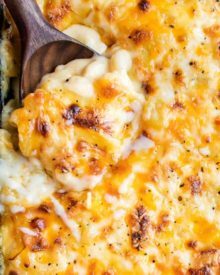 Baking sheets – I’ve had two of these pans for several years and they’ve held up to a LOT of use! WANT TO TRY THIS CARAMEL POPCORN? 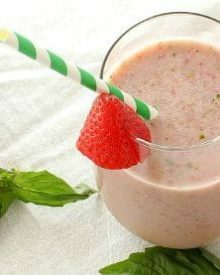 PIN IT TO YOUR DESSERT OR SNACK BOARD TO SAVE FOR LATER! 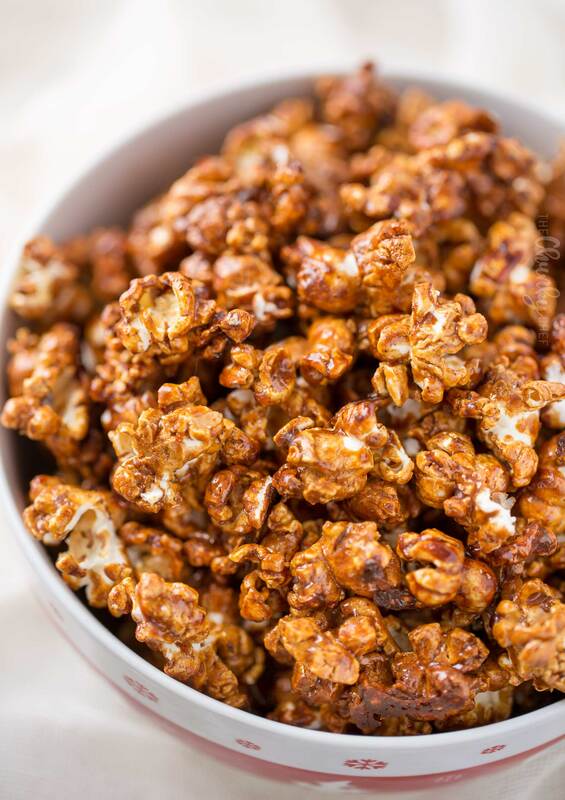 Easy homemade caramel popcorn, with great gingerbread spices. You won't believe how easy it is to make this classic sweet snack! 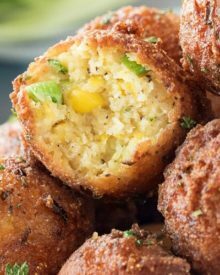 Lightly coat a large (the biggest you have - or if you don't have really large mixing bowls, you'll have to use two and divide popcorn in half), mixing bowl with non-stick cooking spray. Add popped popcorn and set aside. Line two 15x10" baking pans with parchment paper and lightly spray with non-stick cooking spray. Set aside. Preheat oven to 250 F degrees. 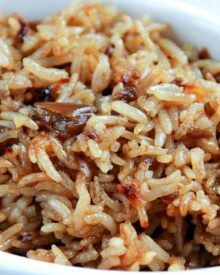 Add brown sugar, butter, corn syrup, molasses, ginger, cinnamon and salt to a heavy bottomed saucepan and heat over MED heat, stirring constantly. Bring to a boil, then boil without stirring for 4 minutes. Remove from heat and stir in baking soda and vanilla. The caramel will foam a little bit, that's okay. Working quickly, pour mixture over popcorn and mix as well as you can. If not all the popcorn is covered, that's okay, as it bakes the caramel will thin out and be easier to stir and coat. Transfer popcorn to prepared baking pans. 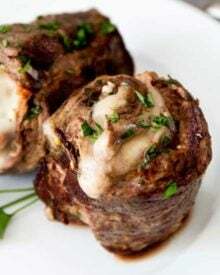 Bake for 1 hour, stirring every 10-15 minutes. Let cool in pans, break apart any large clumps and store in an airtight container. This truly is the perfect holiday treat!! I think I’m going to be making it! Wow this looks SOOOOO good! I would like to share this with my family over the holidays! Now I just need a movie and I am set! Pure perfection. 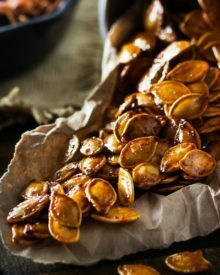 This is thee perfect snack to have out on the table during a party- fun and festive and just the right amount of sweet! Oh, wow! I’m a big Cracker Jack lover, so this really looks good to me! I love the gingerbread twist for the holiday season! Can’t wait to try it! Love this holiday twist! This would be great as gifts for neighbors! !